SF State student Marisa Soski speaks out against the budget cuts to higher education in the Day of Action protest in the Cesar Chavez plaza in SF State on Wednesday, Mar. 2, 2011. Photo by Sandy Ha. Once a fitting title for a day-long demonstration, this year’s Day of Action for Education in California has expanded into a week-long affair. This is a result of networking, promoting and organizing efforts intended to ensure that it will achieve different results. The rally will start at 11 a.m. March 1 in Malcom X Plaza and stop at the Civic Center, the California State Building and then City Hall, ending around 6 p.m. This is only the beginning. A week-long series of rallies and protests will include a 99-mile walk to the state Capitol from Oakland, and a three-day stay inside or on the lawn of the Capitol building in Sacramento. Some participants attribute these additional events and the increase in collaborations to the support of the Occupy movement. Lalo Gonzalez, a criminal justice major and member of Occupy SFSU, agrees that the attention that has been built up around Occupy in the last few months will aid in the success of the Day of Action. SF State is one of almost 50 organizations that will actively be participating in the National Day of Action for Education Thursday. The day is intended to provide an opportunity for unions, associations and organizations to speak out against budget cuts and tuition hikes. Yancey thinks the three-night stay will further the group’s agenda and help to prove their point. Gonzalez also plans to do the 99-mile walk to Sacramento and stay overnight. But not everyone who supports the philosophy behind the movement is as moved to participate. Ernesto Martinez, an SF State Spanish major, has been disheartened by the way past days of action have gone. He attended in 2010 and 2011, and has been involved in activism for more than six years. However, he will not be participating in any of the Day of Action events this year. Gonzalez has a different perspective. He feels that this year’s Day of Action will be more effective because the group knows what they are asking for. Solutions include the Millionaire’s Tax, which would enact a raise in state income tax for millionaires. It could create an estimated $6 to 9.5 billion to fund education and public services, according to the ballot initiative’s website. 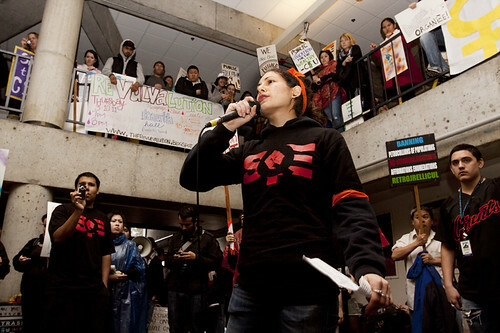 Despite Occupy SFSU’s proposed solutions, some students still don’t think walking out is the answer. According to Villalobos, people need to take direct action for the event to be truly effective.